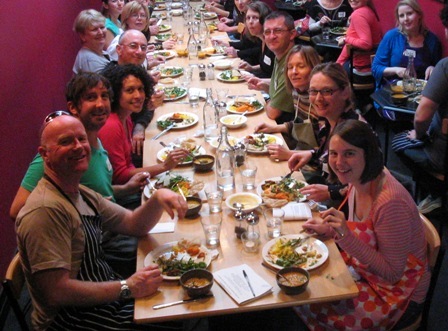 Saturday’s class at Govinda’s in Darlinghurst was rich in superlatives. Biggest attendance ever (30 students), most number of men in a class (always a good sign, I reckon) and the tallest crew ever (I felt like a midget next to some of the guys). I also prepared my best-tasting dal ever, and I had the most fun. How about that! This is Darryn (who towered above me like a gentle giant) and his partner Lydia, pan-roasting our asparagus. Annette seems to have done this before (maybe in a previous life?). This is how all experienced chefs carry the small discs of pastry from the rolling area to the hot wok for puffing into magnificent poori breads. Waiting behind the wok was Michael, fully armed with a stainless-steel spider (yes that’s what they are called). He dove right in (proverbially-speaking) and volunteered to cook all the poories single-handedly. Bravo! All chairs were taken in the cosy alcove area of Govinda’s when it came time to sample groaning plates of the delicacies we prepared. And that’s it for another week folks. Come and join us next time – bookings are filling fast for the October Class.